My wife and I both love books. Looking around our home, I can see five bookshelves without leaving my seat, and there are seven others I could see if I got up and walked a few feet. Martha ordered herself a Kindle for business travel, and she enjoys it thoroughly. She uses it on the road as well as at home. But my real reason for getting a Kindle: I’ve seen many, many friends, family, and colleagues buy a Kindle and fall in love with it; I wanted the chance to do the same. The Kindle Fire seemed like it would be more useful than a dedicated e-reader, since it browses the web and has a color screen, so that’s what I got. (The e-ink web browser is so slow it’s pretty much unusable.) So far, it’s quite useful for casual web browsing, and that’s mostly what I’ve used it for. The on-screen keyboard is useful, but forget about typing more than a sentence or two on it. 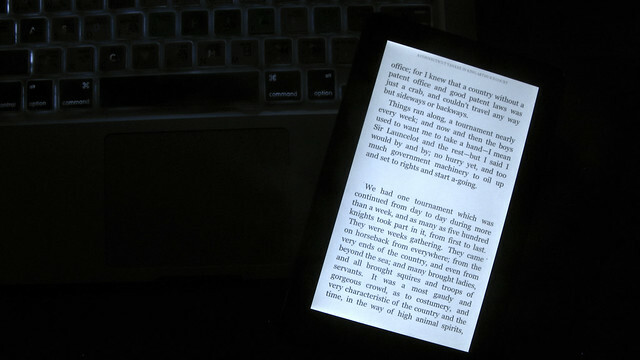 The problem is that it’s more of a tablet computer than a dedicated e-reader; it doesn’t feel like an e-book machine, it feels like a machine that happens to do a very good job as an e-reader. But, despite that, this is a Kindle. It says so on the back of the case. How easy is it to read on? When you wake the tablet up from sleep, the background pictures are all of old media: 35mm film, cassettes, metal type, pencil tips. It’s pretty, but doesn’t feel at all bookish, like the regular Kindles do. The backlit screen is nice, and I’ve used the Fire for lead sheets when rehearsing with my band. (Legal-sized PDFs with large text look quite nice on the Fire screen.) My favorite apps so far are CalenGoo, which syncs Google Calendar to your Fire, and Wi-Fi analyzer, which turns your Fire into a kind of Wi-Fi Geiger counter. Evernote looks like it’ll be quite nice, if I can figure out what to do with it. There’s a Netflix app, but I don’t know if the Fire has enough battery life to watch a lot of video. The selection of apps is a little sparse compared to the iPad or even other Android tablets. Amazon’s decision to not support the Android market hurts the tablet; it could be a much more useful device than it is. I’ve been finding that I tend to read faster when reading on a Kindle. I didn’t expect that, and it seemed strange until I figured out why. When I’m reading on the screen, it’s usually for work, and so I associate it with working efficiently. When I read on paper, it’s something I savor. Reading on the Kindle Fire is, at least so far, an experience somewhere in between the two. Overall, I’m very happy with the tablet, but I haven’t fallen in love with it like Martha has with her Kindle. While I haven’t read an entire novel on it yet, I intend to. I’ve loaded it up with Mark Twain, Oscar Wilde, Edgar Allan Poe, and a few books on grammar and writing. It’ll be nice to go into the city and leave my laptop at home next weekend. Ask Ceil is on a short hiatus, and will return on Fridays soon. Until then, why not ask her a question? Neil Fein is a freelance editor who loves his work. On the side, he’s the guitarist in the band Baroque & Hungry, he rides his bicycle as much as he can, and he paints when the mood strikes him. I’ve been considering getting a Kindle, but as you (and other people I know) have mentioned, there is a tendency to read faster on Kindle than a regular book. I’d attribute it to the fact that when reading something on a computer screen, most people skim whole articles or follow an F-shape pattern, looking for the most important information at the top and skimming later. I’ll probably still get one eventually though, if only to make life easier on long trips. I own what is now referred to as the Kindle Keyboard. I’ve owned my Kindle for almost two years, and absolutely love it! I appreciate your review of the Fire, but just piggybacking on something that you said. 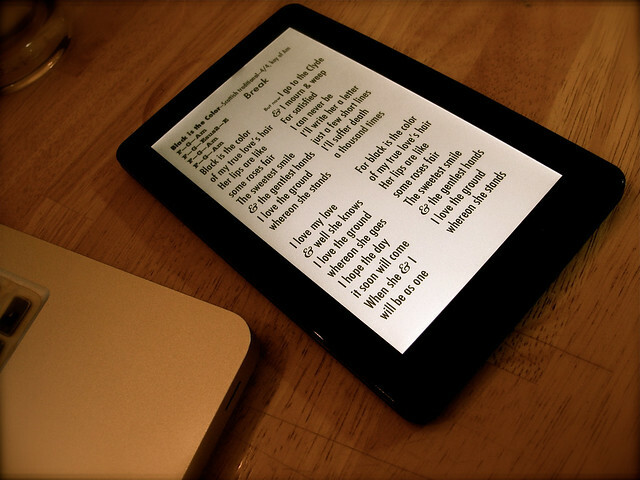 When and if a color e-ink screen becomes available is when I’ll get my Kindle Fire. I have read A LOT–and have trouble reading from a screen that is not e-ink–hopefully a color e-ink is in the works! @Alex, @Kathy, thanks for your comments. Have traded in the Kindle Fire for an Android tablet. I’ll let you all know soon how it stacks up as a reading machine. Pingback: Twain | Everything Kindle!